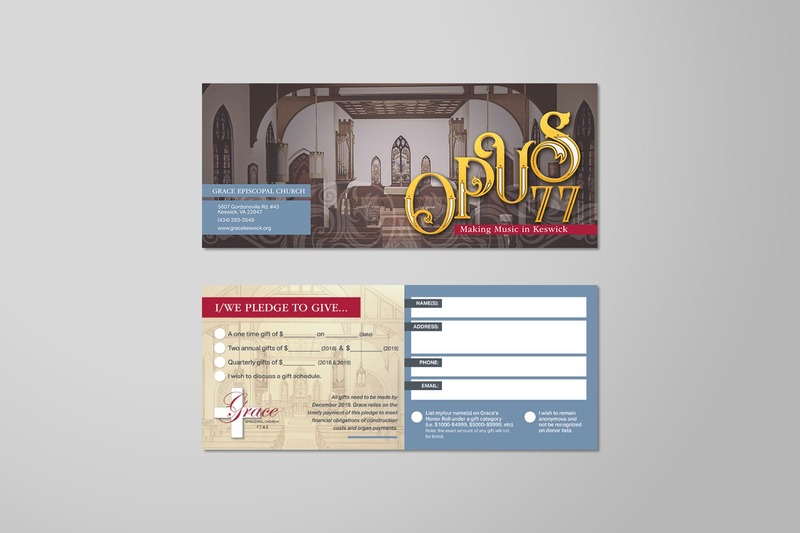 Church capital campaign theme / slogan: "Opus 77"
Grace Episcopal Church (Keswick, VA) worships with music and celebrates the creativity of nature and the miracle of infinite Love. Because of its 1745 origin, the church harbors peerless architecture and interior design of historical note. A late fall storm in 2015, destroyed their organ's pipes, plaster, and inner workings. The Keswick community formed an organ tasks force to restore the Church's instruments back to its original sound and beauty. Their church capital campaign theme was "Opus 77," which is the name of the new organ to be installed by Taylor & Boody Workshop. Therefore, we develop Victorian styled campaign deliverables to support the spirit of their case statement, style of their church, and nature of the project. 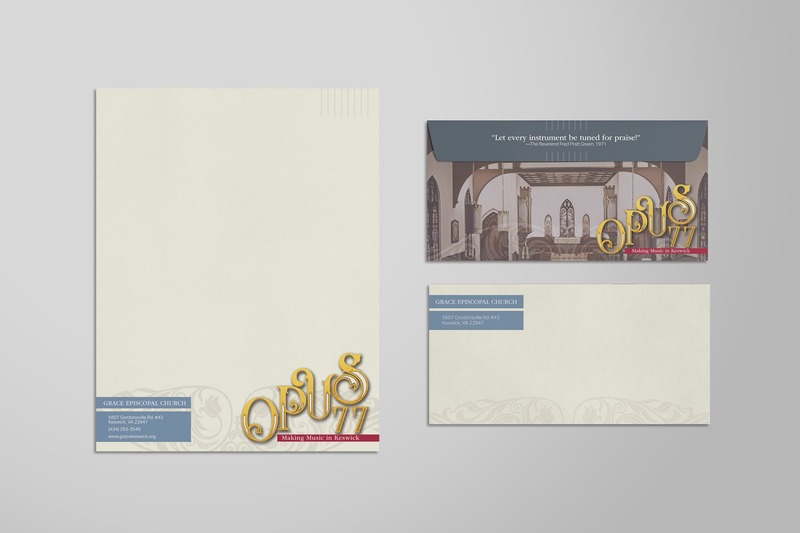 Victorian-styled Church Capital Campaign Theme Logo to coincide with the church's pipe organ repair goals & interior decor. 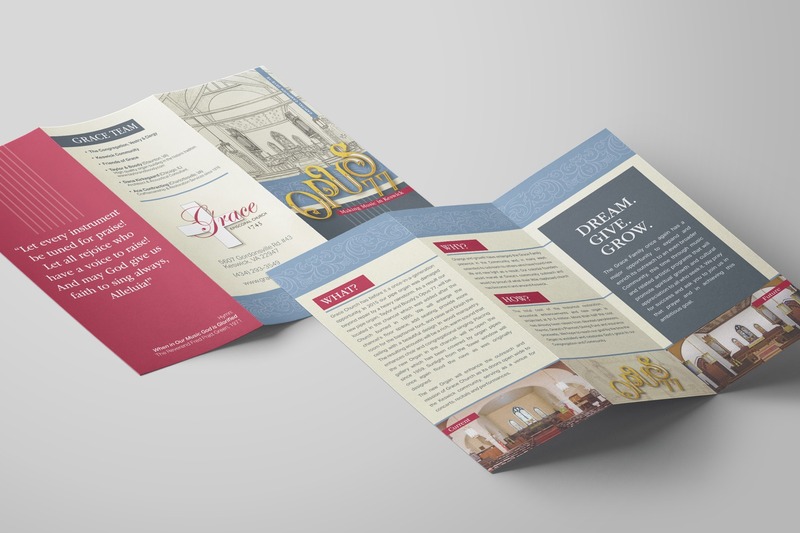 Church Capital Campaign Brochure: Full color – 2 sides, 9 × 12 in.. trifold, 100 lb. Dull Cover w Matte Finish.